For a Miniature Schnauzer owner rainy weather raises the question of how to keep your dog dry. This applies to most dogs, other than working dogs, of course. They are hardy and deal easily with climatic conditions. Whether a Miniature Schnauzer or any other dog should be kept dry in rainy weather is a matter of choice. There are dog owners who encourage their dogs to play outside in the rain and enjoy the muddy puddles. Alternatively, there are dog owners who prefer not to have their dog soaked by the rain, nor have muddy paws to deal with when the dog enters back into the house. Dog owners have the option of whether to walk their dog in the rain. But, it is important to be aware that even though walking is necessary for exercise, not all dogs can cope with rain. Heavy rain pouring down and saturating the coat can cause a dog discomfort. Some dogs can get by with rain and this usually depends on their breed. Though of small stature, the Miniature Schnauzer is sturdy and usually can cope with rainy weather. But, it’s not always a matter of a dog enjoying or disliking the rain. The question of how to keep a Miniature Schnauzer dry in rainy weather is sometimes due to the age or health of a dog. Some dogs as they age, are susceptible to joint stiffness that causes pain. Consideration of health conditions such as these should be taken into account when deciding to walk or not walk a dog in wet weather. Even in dry weather, if the temperatures are cold, provision should be made to keep a dog warm. This applies not only to being outdoors, but also indoors. 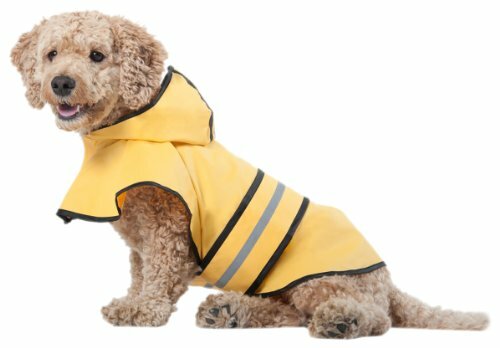 Suitable dog clothing is available to protect dogs when walking in the rain. Also warm jackets will help to keep a dog from suffering cold temperatures. Other than walking a dog for exercise, there are toileting times to be dealt with. And when potty training a young dog, be it a Miniature Schnauzer or any other breed, attention to this training must be regular in spite of the weather. 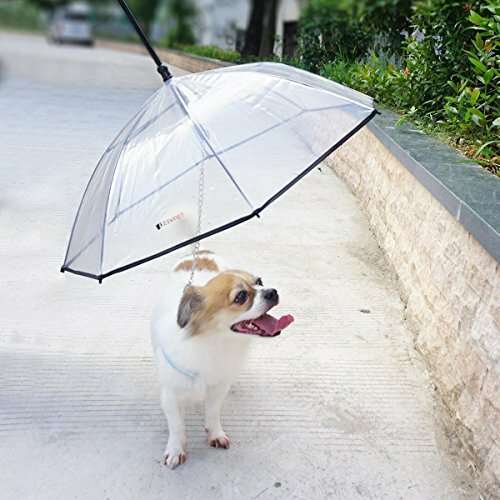 There is a variety of rain wear available for dogs, including the leash type umbrellas, as seen above. These might be a little cumbersome but can be the answer to keeping a dog dry during the potty training period when puppy decides to take his time in finding the right spot that to complete the task! Whatever the choice, whether it is rain gear or not, walking your dog for exercise needs to be a pleasant experience for both you and your pup. Make it the best you can. Your comments and questions are welcome. Please leave them below. Watching a dog performing tricks is one of the most pleasurable activities to be enjoyed. When it comes to performing tricks Miniature Schnauzers are no exception. In fact, Miniature Schnauzer dogs are particularly keen on showing off their cool dog tricks. Because of a dog’s loyalty to their owner, they just love to please and that includes performing tricks they have learned. Most tricks are taught to dogs, but I once knew a little dog that made up his own tricks. That little dog was very proud of his tricks and performed them to anyone who cared to join in the fun of watching him. There are a great number of tricks that can be taught over and above the usual Sit and Stay. I don’t class Sit and Stay as tricks, although I’m aware that some people do. The trick, playing dead, might not sound the best but it is harmless and fun to watch. The owner of the dog points his finger at the dog and says ‘bang’. When the dog hears the word ‘bang’ he drops to the ground and lays still. Another action great to watch is a dog intertwining his body between rows of tall pegs in the ground. Again, this can be classed as training, as in preparing for a competition or show. It can also be considered a trick, and a valuable trick when it comes to a dog’s concentration and exercise. Setting aside time to teach your Miniature Schnauzer some cool tricks is helpful in respect to your dog’s mental and physical health. Playing ball games with your dog or young puppy can also be considered as tricks. 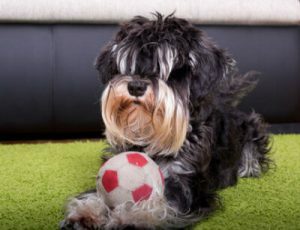 Thinking creatively about teaching your dog a certain way of catching a ball, hiding it and finding the ball again can be included in his list of cool dog tricks. In the video below you can see a young Miniature Schnauzer dog performing her tricks. I could see how much this dog enjoys the activity. Her concentration and fitness level are amazing and reveal her desire to please her owner. I once saw a dog putting his toys into his Toy Box. It was unbelievable that a dog would be so tidy as to do that. However, did you watch the video and see the dog placing the rings over the stem of the toy? If so, perhaps you will agree it is possible to train a dog to put his or her toys away when finished with for the day. Well, it’s worth a try, and can be considered as another cool dog trick your Miniature Schnauzer loves to perform. Thank you for visiting this post. I look forward to receiving your comments and/or questions. 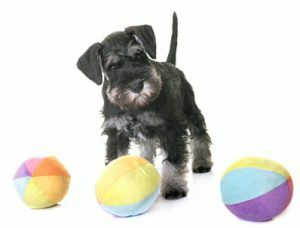 Miniature Schnauzer puppies have many talents and are not shy when it comes to displaying their abilities, especially in the realm of fun. What’s better than chasing a rabbit if one can be found to chase! Or, chasing your sibling around the garden just for the fun of it! In fact there is seldom a dull moment when a Miniature Schnauzer puppy is on the scene. The Miniature Schnauzer is expert at entertaining with a variety of noises only a Schnauzer can produce. Mini Schnauzers take pride in their howling noises. No doubt that’s the wolf in them just warning humans that in spite of their smallness there is power in that little body. As household pets, they look cute when they are howling. But then, Miniature Schnauzer puppies are cute whatever they are doing, except when they misbehave. But, on occasion, even their misbehavior can be cute and cause us to be most forgiving. Anyway, what puppy doesn’t misbehave at some time! So, What Does Happens When Miniature Schnauzers Dance the Can-Can? Who makes the most noise? I believed it is us, the owners and lovers of Miniature Schnauzers responding with our laughter and applause. On the other hand, when you watch the video I doubt that you would agree! These puppies are so much fun and irresistible when they’re on the move. I just can’t help laughing when a Miniature Schnauzer is performing their act so diligently. Mini Schnauzers react well to music. If the music is to the right tempo it is more than likely a Miniature Schnauzer will put her dancing shoes on! In the video below you can see Mini Schnauzer puppies performing to the sound of Offenbach’s music which is so often related to the Can-Can. I came across the video and just couldn’t resist sharing it on this website for visitors to see. I hope you enjoyed watching those delightful puppies as much as I did. The only thing missing is the frilly skirt Can-Can dancers wear. I’m not sure a frilly skirt would have survived the outdoor activity during the dance interval! Your comments are welcome. Please leave them in the space provided below. Who Said Miniature Schnauzers Can’t Run? Don’t Believe It! It’s unlikely that anyone said Miniature Schnauzers can’t run. 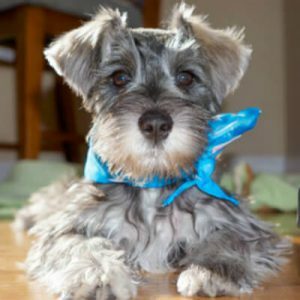 I couldn’t resist highlighting the immense energy of the gorgeous Miniature Schnauzer puppy in the video on this page. He is totally focused on the task set before him. Obviously this little Mini Schnauzer has been training regularly, to be so skilled as to know what is expected of him at every stage of the course. Not only is he running at a great pace, but he is achieving each part of the course without hesitation. It is incredible that dogs have the ability to achieve at levels that many humans could not achieve. Yes, I know there are wonderful athletes throughout the world and we see them on television competing to a high level. They are to be admired and congratulated. But as humans, we know that each achievement leads to something greater in our lives. But, a little dog such as this Miniature Schnauzer keeping his focus and letting nothing distract him is amazing. No matter how we talk to our animals, it is unlikely that they could understand how one achievement can lead to another. These little dogs are happy to do what we ask of them. They live for the moment with no expectation of the future, or of anything other than the love and support of the person who is their leader and greatest companion. We reward our Miniature Schnauzers for good behavior, as we do for their achievements. 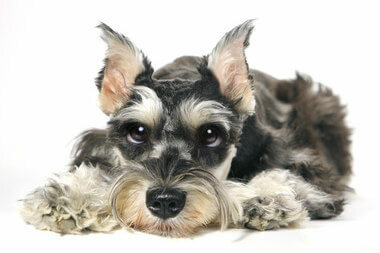 Not only do we reward Miniature Schnauzers, we do the same for any other breed of dog. Receiving rewards are part of all dog training. But looking at this little dog in the video, I’m sure he’s not thinking of the rewards coming to him. He knows he has a task set before him and he goes flat out to please his owner. That’s what our dogs do. They are devoted to their owners and will do anything to please them. The nature of Miniature Schnauzer dogs is that they are feisty. In other words, they are lively, spirited and energetic and nobody could argue with that after watching the video. I hope you enjoyed the experience of seeing this little dog in action and noticed that he achieved First Place in the Finals. No surprise there at all. Thank you for visiting this page. I welcome your comments. Please leave them in the space provided below. Miniature Schnauzers are known for their love of activity. They are a feisty breed and therefore not too keen about just sitting around and filling in time doing nothing in particular. If you are owner of a Miniature Schnauzer I’m sure you will have experienced your puppy’s mischievous behavior on many occasions. Most of the mischief of course, being the result of boredom which is natural in a young puppy. Most young dogs need to be either entertained or provided with some type of activity to stop them from becoming bored. Of course entertaining a puppy all day long is not possible for most families. To remedy this, a fully fenced outside area where puppy can get some exercise by exploring is ideal for a Miniature Schnauzer. As mentioned elsewhere in this website, the Miniature Schnauzer was bred to be a digger and a hunter of rodents. So, outdoors on your property provides some ideal exercise for your Miniature Schnauzer. In saying that, you may not be too happy about having your garden dug up. If this is the case, a contained area within your garden may be required. 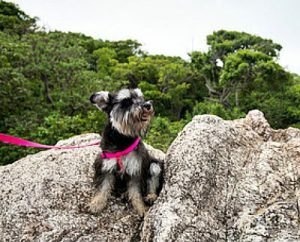 In Reality – How Much Exercise Does a Miniature Schnauzer Need? In a situation where there is a young family and plenty of activity going on, a Miniature Schnauzer puppy would have the benefit of running around and playing with family members. Therefore, the need for regular walking activity, although important, would be less than a Miniature Schnauzer living with an adult family, and consequently not so much activity in the home. In the case of an adult family where less activity happens within the home property, walking your Miniature Schnauzer puppy at least once a day is essential. Walking a puppy on a leash along the footpath or sidewalk is one way of ensuring adequate exercise. Additionally, if there is a park near enough to your residence then walking puppy to the park and allowing him to have a run around the park is ideal. If you do take your Miniature Schnauzer, or another other breed of puppy, to exercise in a park it is essential that you take a long lead. Puppy can get all the exercise needed by having a long lead attached to his collar. This gives you full control while at the same time your puppy can frolic and explore the wonders of the outdoors. I recently watched a video of a young Miniature Schnauzer out with his family on a climbing expedition. I was so intrigued by this adorable young dog that I decided to share the video with you on this website. Of course, you may have seen this, but if not, I do hope you take the time to watch it now. This video is proof of just how feisty the adorable Miniature Schnauzer really is. He just kept on going as though he knew he was about to achieve something wonderful. Not quite Mt Everest, but a wonderful achievement for a young dog. I welcome your comments and/or questions. Please leave them in the area provided below.